Posted April 15, 2016 by Tony Jones & filed under Books. For most people who watched British TV in the late 1960, the series The Avengers was about John Steed and Mrs Peel. Yes, we also had Tara King and Cathy Gale as companions to the bowler hatted Steed, but it’s Mrs Peel who most captured the show’s period feel of psychedelia, fun and champagne interspersed with spies, villains and strange science. Big Finish has been wowing its audience with the so-called Avengers Lost Episodes since 2014. In these stories the more series first season of The Avengers, focussing on Dr Keel and Steed, are recreated on audio. In the part of Steed is Julian Wadham (English Patient, War Horse, Casual Vacancy), accompanied by Olivia Poulet (In the Loop, The Thick of It) as Mrs Peel. 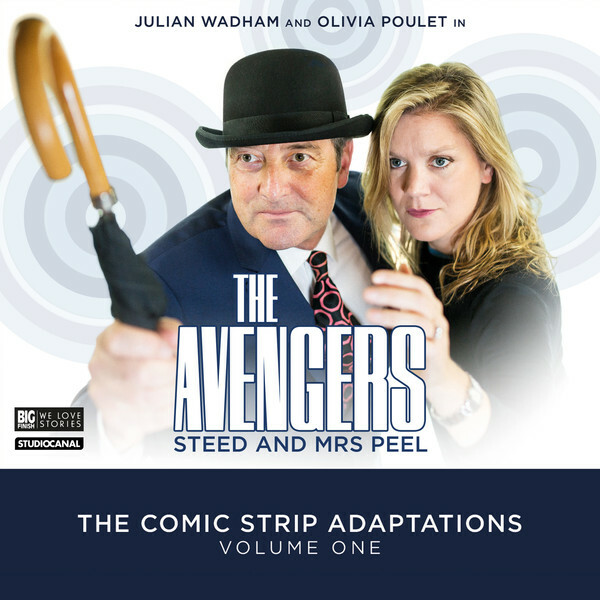 We knew Wadham was a great Steed, one of the many joys of this new set of audios is how perfect Olivia Poulet is in the part of Mrs Peel. This particular release consists of four CD-length stories, adapted from comic strips in Diana comic between 1966 and 1967. The stories were adapted by Big Finish stalwarts Simon Barnard, Paul Morris, Paul Magrs and John Dorney and each fizzes with the mood of the 1960s (as well as plenty of champers). In these gripping tales we get strange Scottish ghosts, mysterious spies, a new meaning to the idea of a sleeper train, blackmail threats to London’s banks and maddest of all actual Vikings on the Norfolk broads. Steed is suave, Peel is an action hero, fully capable of besting any number of petty thugs, and life is sunny afternoons, open top cars and enjoyment. Happy days! From the very first moment these episodes grab the attention of the listener and never let it go; the reason is the wonderful music, recreated by Alistair Lock and Steve Foxon. All the music and soundscaping is evocative, and while the stories revolve around the main characters, there are several other parts to cherish. Voice artist John Banks takes on several of these, and Jacqueline Pearce is wonderfully larger-than-life as Madame Zingara, designer of the latest fashion sensation. If there is a weakness, it is that the Diana comic only ever printed eight stories. With these four already realised, we will only get to enjoy one more set of these adaptations, and that one due in November this year. Surely Big Finish must find a way to keep us thrilled with our favourite and most glamorous crime-fighting duo? Released in April 2016 by Big Finish Productions Ltd.